As I gazed from the tuna tower, a sparkle on the horizon caught my attention. Training my eyes on the spot, I saw what appeared to be a disturbance on the surface about a mile from our boat. Excited, I shouted down to Captain Rogelio for confirmation. "No, just bonito," came his reply. We continued the search, and 10 minutes later that disturbance was still in the same position. Bonito move fast and savage their prey in minutes, so I knew something else was out there. Closer investigation was needed, and with guarded excitement we set an intercept course. All eyes fixed on the horizon as a hush fell over our team. Six months of anticipation had led up to this expedition — one that depended solely on our captain's intuition and our best guess at timing. A dozen miles off the coast of Mexico's Isla Mujeres, we had been searching these empty seas for hours and had not found anything. But that changed in an instant as a large fin suddenly appeared and cut across the surface only 50 yards from our boat. Beyond it more fins appeared — five, 10, 50 … hundreds. Our team erupted into cheers — we had found it. Whale sharks were everywhere, feeding on the surface for as far as the eye could see. 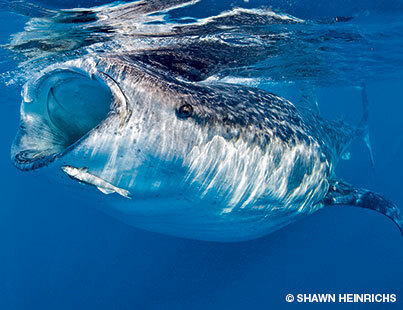 Like combines harvesting a field, lines of whale sharks with mouths agape plowed back and forth in the water. We could not believe our eyes, and we had no idea how long the feeding would continue. A mad scramble ensued as each of us fumbled for our snorkel gear, snatched our cameras and tumbled into the sea. When the bubbles cleared, what I witnessed was beyond anything I had ever imagined possible. 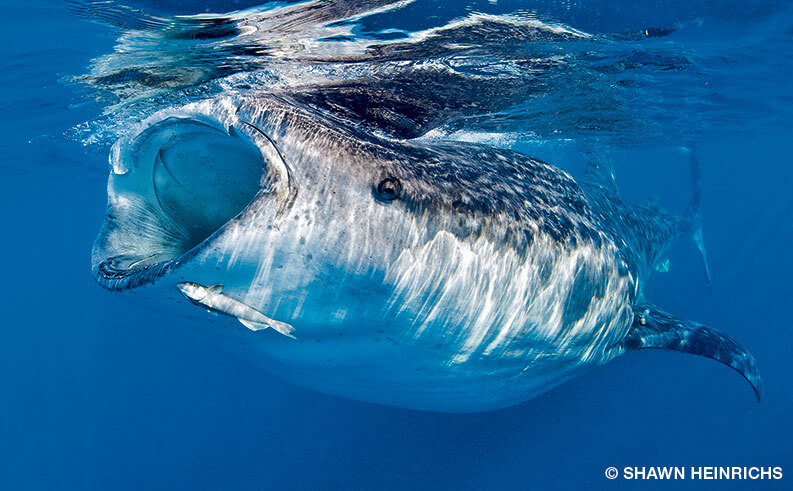 The whale sharks appeared as dark silhouettes against the deep, blue water in the early morning light, and they were bearing down on me from all directions. Closer and closer they approached until I realized they were not going to stop. These whale sharks were on a mission, and my presence was of no concern. At the last moment I kicked out of the way, just as the huge mouth of a gulping shark filled my viewfinder. There were spots, a dorsal fin and more spots followed by powerful surge from a massive tail that brushed within inches of my mask. I whooped and hollered, but my celebration was premature. In averting this group of whale sharks, I had landed in front of another one coming from behind me. Moments later I felt my back being sucked into a shark's mouth, and suddenly I was tumbling in its slipstream. A group of whale sharks steamed by, running headlong into another whale-shark train and colliding like a rush-hour pileup. The action continued well into the afternoon until our bodies were spent, our batteries drained and flash cards full. Exhausted and all grins, we headed back to Isla Mujeres to celebrate with cervezas and guacamole. Explore more great sailing and cruising destinations on SAFE PASSAGE.